Enjoy the luxury of your own exclusive beach lounger for two. 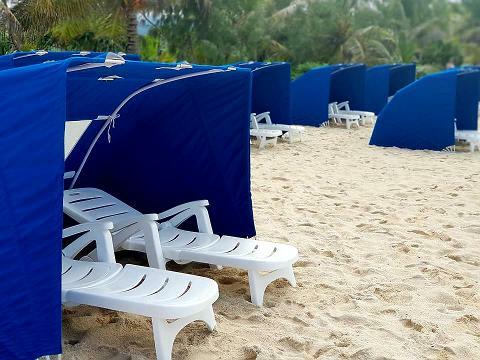 The beach loungers are clam shell beach umbrellas that offer privacy and protection from the sun. They are set up on a beautiful part of the beach at Mystery Island close to other activities such as stand up paddle boarding, snorkeling sites and the markets. Nap under your shade, swim in the clear azure waters or unwind at your leisure. Its paradise with a hint of luxury, set amongst the tropical splendour of Mystery Island. This rental is sold by the clamshell. Please book per clamshell and not per person. Each clamshell can accommodate up to two guests. Full payment is required prior to tour departure. Mystery Island Tours reserve the right to cancel the tour based on weather forecast or other factors. In this case, we will provide you with a full refund (less any bank charges). If you cancel your booking 24 hours or less ahead of departure time, 50% of tour cost will be refunded less any bank charges. If you are a no-show: 100% of tour cost will be charged. In the event that the cruise ship does not make it into port on your booked day, we will provide a full refund (less bank charges). Refunds will be processed within 14 days of the ships cancellation date.